Well it’s official, Spring is finally here! The weather’s brightening, the days are getting longer and everything is looking a little greener. We’re all enjoying the change but nowhere is showing the signs of Spring quite like Japan at the moment, where it’s Hanami season. Hanami, or “flower viewing” is the traditional practice of going outside with friends and family to see the cherry blossoms bloom. When I was visiting Japan, I experienced this first hand and it was a truly amazing thing. For just about two weeks all over Japan the Sakura blossoms come out all at once, totally changing the landscape in the country and city alike. The tradition has been going for well over a thousand years, ever since the Emperor Saga first ordered his court to be moved outside so that they may feast under the blossoms. Since then it has remained a huge part of Japanese culture, so much so that huge parties are thrown in parks and garden across the country to celebrate the yearly tradition. There is even a dedicated weather forecast showing the “blossom front” as it sweeps across the country. The trees, in their full splendour were framed against the snow covered slopes of Mount Fiji is quite stunning. But you don’t have to be Japanese or even in Japan to enjoy Hanami. Botanical gardens all over the world from Boston to Kew are known to host events to view their Japanese blossoms blooming. The best part is that Cherry blossoms are easy enough to incorporate into any garden, especially in England, where the humidity and temperate climate are actually very similar to a lot of Japan. Of course your choices aren’t just limited to those iconic pink cherry blossoms, you can also have the equally traditional white plum blossoms or Ume that are favoured just as much as part of the Hanami celebrations, or maybe pick something from a little closer to home like a wisteria or even a good old English apple tree. 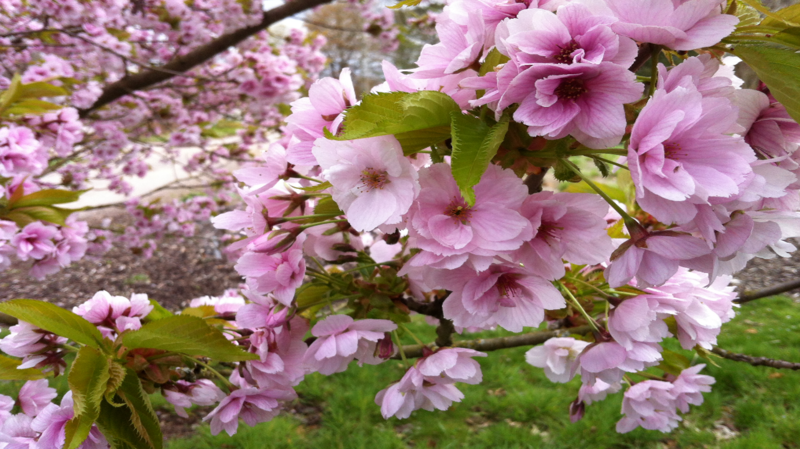 Whatever your fancy the addition of a blossoming tree will give your garden a gorgeous flourish to welcome in the Spring.